In an effort to prevent the school from closing, Marymount College students march with signs. 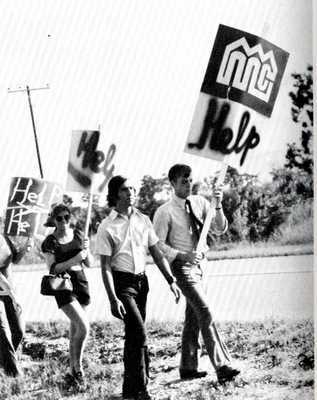 Students planned marches, car washes and went door to door with soup cans reading "Save Our College" in an effort to rescue the college. On Nov. 1, 1971, educator and later president, Donald Ross visited Marymount College to purchase its library books and instantly fell in love with its beauty. He was able to convince the Wilmington College board of trustees to unite with Marymount and purchase the school instead. Lynn University, College of Boca Raton, students, marches, soup cans, Donald Ross, "Save Our School"